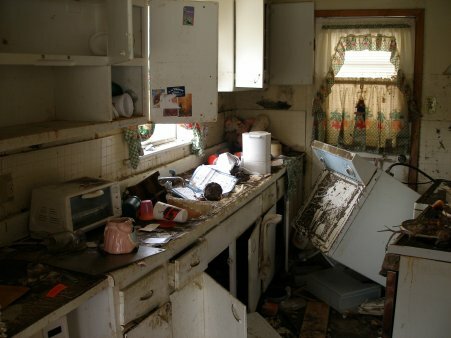 Every home in Lakeshore Mississippi suffered major damage from hurricane Katrina. Many of these homes no longer exist. Others can be salvaged by gutting the building and using the existing structure as a skeleton. With the help of volunteers from across the country, Lakeshore Baptist Church has launched a massive rebuild effort in our community. A list of over 25 homes stand in various stages of rehabilitation. We add more addresses regularly. One of these homes, pictured here, belongs to one of our church members, Mrs. Violet Patterson. When Lakeshore Baptist Church called me as pastor 11 1/2 years ago, Mrs. Patterson’s husband served as the church’s only deacon. He passed away a few years later. Her two children and their families also lost their homes in the storm. 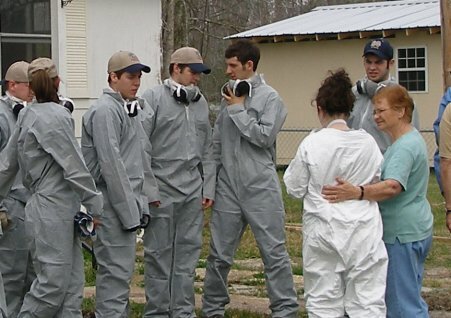 Hurricane Katrina flooded Mrs. Patterson’s home and left her a homeless widow seeking refuge with family members in Alabama. She planned to bulldoze her house in Lakeshore, assuming it to be a total loss. Not knowing which way to turn she called on God for guidance. 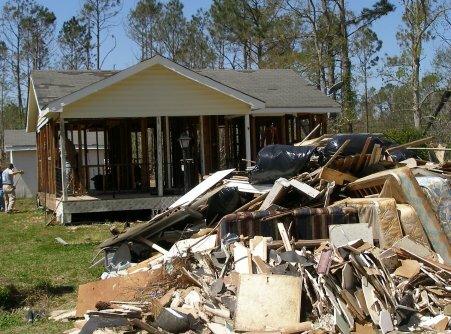 Without sufficient funds to completely rebuild, she asked God to “open a door.” After assessing the damage to her house, we realized we could indeed salvage the structure. We had to demolish an addition that had been added on the back, completely rip out all the sheet rock, insolation, wiring, and plumbing. We even had to remove the water-logged siding. This past Saturday a team removed the old shingles and replaced her roof. We need skilled laborers to volunteer to complete this project and get Mrs. Patterson back into her home. 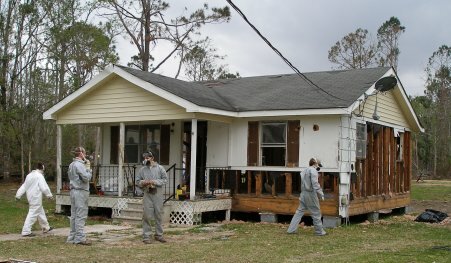 If you would like to come help with this house, or similar projects, please call our church office at (228) 469-0110. We work with a very limited staff, so please leave a message and my administrative assistant JoEll, or our project coordinator, Greg London, will return your call. 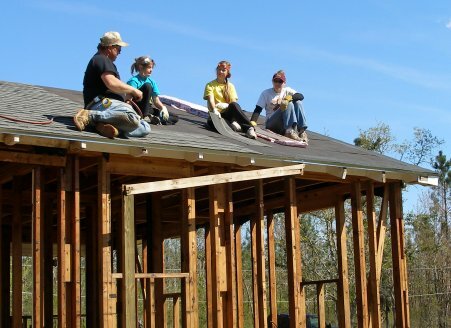 We need roofers, electricians, plumbers, framers, folks who can hang and mud sheet rock, finish carpenters, those able to lay flooring, painters, and other skilled help. We would love for you or your group to plan a trip to Lakeshore. We have housing and meal arrangements on our church property and host teams on a regular basis as we rebuild Lakeshore to the glory of God. Please come and help. My friend, Stephen Ake, made his sixth trip to Lakeshore last week. Stephen serves as a member of Grace Bible Church in Canton GA. I received a blessing from his decision to spend his spring break from Georgia Tech with us. Read his account of the week, part 1, part 2, and part 3. Check out his photo gallery. He has dozens of pictures from his previous trips and I’m sure he will ad his spring break pictures soon. Pictured above, left to right: Stephen Ake, Dave Stephenson (pastor of Grace Bible Church, Greg London, and me. btw, today is Stephen’s birthday. 🙂 Happy Birthday Stephen. 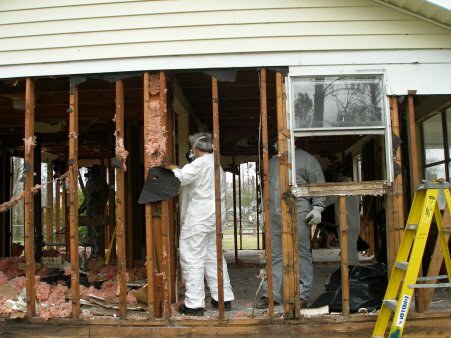 Six months after the storm we still see no end to the clean-up and recovery efforts. I must admit my human frailty. At times we feel the strong temptation to buckle under the overwhelming burden. This morning I walked through a freshly gutted house that suffered 11+ feet of water. The gravity and scope of the destruction hit me again. As I type this, I look out of my camper window to a devastated landscape of downed trees and scattered debris. Only God’s merciful outpouring of sustaining grace upholds us and drives us forward to His glory. Through the recovery efforts we see God’s strong hand of providence at work. He continues to send us hundreds of volunteer teams from across the country. This week Lakeshore Baptist Church hosts over 100 hard working individuals busy rehabbing homes, running our distribution center, working on the church property, and ministering to our community. For example, today alone we have teams working in nine houses as we try to help the community get out of cramped campers and back into their homes. Today they are out there, laying flooring, installing cabinets, painting walls, rewiring, and framing doors. They are also gutting and mucking out two houses getting ready for rehab. In between answering the phone, directing volunteers to the next task, meeting folks bringing in donations, finding a place to store 80 donated windows, and other things, JoEll and I line up the locations for teams to work tomorrow. In the last couple of weeks we have made major rehab progress in over two dozen homes and have active plans for several more. In addition to the houses, we have a team from California running our portable saw mill. We use downed trees from the storm to rebuild. We have built over 100 6X8 storage sheds for families in our community living in small FEMA issued campers. The lumber from our mill has studded up the walls in our temporary metal building on the church property, built one home from the ground up, and provided material for countless other projects. Today, on the church property, we have a team building more bunk houses to sleep more volunteers. Our camp kitchen, that feeds 100+ workers 3 meals a day, looks like a bee hive of activity. One team works on the sewage line, another builds shelves in the expanded pantry, another team installs ceiling fans under the tarp roof, all while the cook team prepares the evening meal. On the other end of our property, a team strings out the dimensions of a new office building. We built one small room in our temporary building for an office, but our cell phones can’t penetrate through the metal, nor did we anticipate the space required to run the massive efforts God has led us to undertake. We now attempt to work in my camper. Three of us; Greg London, (our project coordinator), JoEll (our new administrative assistant), and I trip over each other as we try to work out of the same small place that I sleep at night. The distribution center, here on the property, still sees 100-300 people a day. The donations of non-perishable food items, cleaning supplies, and household items still pour in and flow through our center. Whenever we begin to run low, God graciously puts it in the heart of a church somewhere across the country to send more goods our way. We see God using this very tangible ministry to meet daily physical needs and spread contagious hope throughout our community. Everyday God orchestrates a cacophony of graces over the sound of pounding hammers, buzzing saws, beeping fork-lifts, and grinding big equipment mixed with the tears and laughter of Christian volunteers ministering to storm ravaged locals. Please continue to pray for Lakeshore Baptist Church as we see God impacting our community for His glory.